Tough and durable, but not thick and chunky! 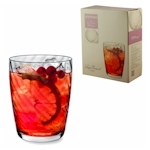 The Hypnos rage of lead-free glassware from Luigi Bormioli is made from Titanium reinforced SON.hyx glass in Italy and features a hypnotic spiral design in each glass. Suitable for both home and entertaining, Hypnos is also dishwasher safe, retaining its brilliance through 4,000 wash cycles. Strong, lead free tumblers with a hypnotic spiral design. 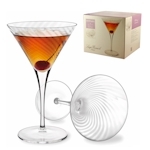 Strong, lead free martini glasses with a hypnotic spiral design.